Why is Walmart investing $250 million in this Interactive Content creator? Walmart announced the creation of a joint venture with Eko, an agency that creates interactive videos, called W*E Interactive Ventures. We went on a bit of a Twitter rant this week on the shutdown of Lena Dunham’s Lenny Letter. 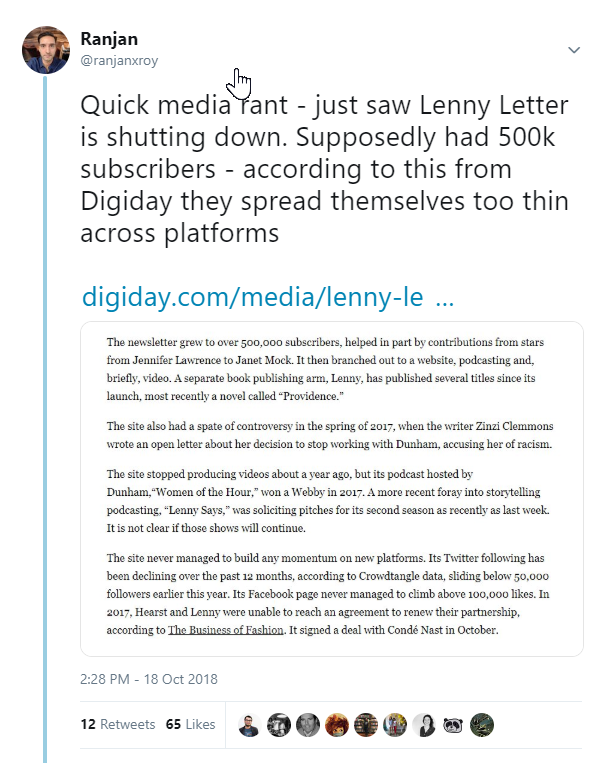 Just six months after the product’s launch, publications were covering their miraculous six-month growth to 400,000 subscribers and a 65% open rate. We send a lot of newsletter campaigns, and many of them are pretty good, with the metrics to back this up. Those numbers do not make sense. The larger problem, and this was central to the resurfacing this week of the Facebook video metric scandal, is how misrepresentation of metrics ends up distorting expectations and conversations throughout the industry. The publication is doing an incredible job on Medium going behind the scenes on their journalism. The read-later app Pocket has created a branded content product that feels both native and creative. While their regular newsletter features a general selection of curated articles, they also publish a sponsored newsletter that has brand-specific content for you to read-later. Working with brands like Salesforce, Pocket curates a collection of articles directly relevant to the partner company’s brand. 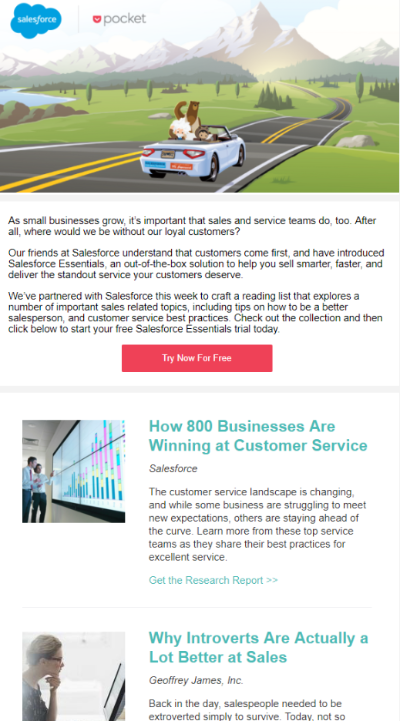 In the case below, there are two articles directly from Salesforce, but the rest are from leading publications like the Harvard Business Review or Business Insider on the topics of sales and CRM.